WOOOW! Cheapest flights to Hawaii in history: from Prague for only €397! UPDATE 15.35: flights from Prague are not available anymore for this price but we discovered new departure airport for you! Lisbon-Honolulu for €393!! Same travel dates as below! Wow this is incredible! British Airways and American Airlines now offers super cheap flights to Hawaii from the Czech Republic! 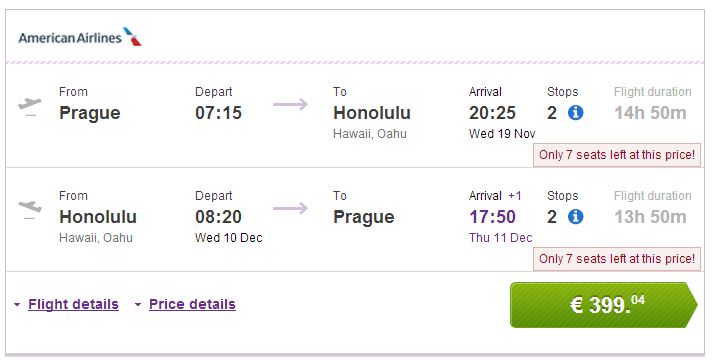 Return flights from Prague to Honolulu are available for insanely low €397 / 10998 CZK! You can also fly to Kahului (island Maui) or to Kona (Hawaii) for the same price! This is unbelievable offer considering it’s classic return flight from and to Prague where normal prices reach at least €1000! Travel dates are from middle of September until end of May 2015! Transfers are perfect just 1 or 2 hours! Book via BudgetAir to get this crazy low price! Hurry up, this is most likely error fare that won’t last long! « Cheap flights to Florida from Prague for only €398!